Barely making it into the 80s is another of my favorite villains, the bane of Teenage Mutant Ninja Turtles, Shredder. Originally Oroku Saki, the Shredder leads the robotic Foot Clan against the heroic reptiles, stealing super-weapons and kidnapping April O'Niel. Shredder is the prime example of villain entropy - the very beginning of the series, Shredder was a competent villain with realistic goals, but quickly devolved into plans that made no sense with zero chance of accomplishment and being defeated by the least amount of effort by the Turtles. By the later seasons, I seriously felt bad for Shredder. One of the reasons why I felt his fall was the worst was because he had a partner. You can't talk about Shredder without mentioning his cohort Krang. Unlike a number of other villains who have an established second-in-command (like Starscream to Megatron), Krang was Shredder's equal. He took no orders from Shredder and tried a number of his own schemes against the Turtles. 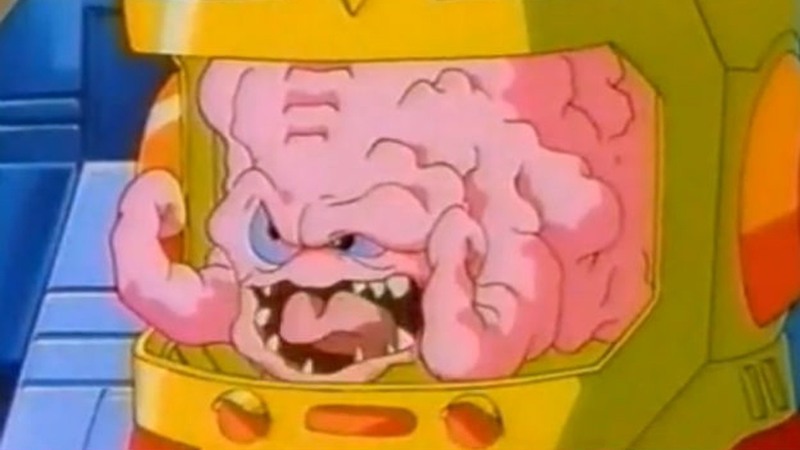 I honestly think Krang was the more successful of the two - the majority of the equipment, including the Technodrome, belonged to Krang. Krang has his sights a lot higher than Shredder too. You know what, I'm changing my favorite to Krang instead of Shredder. 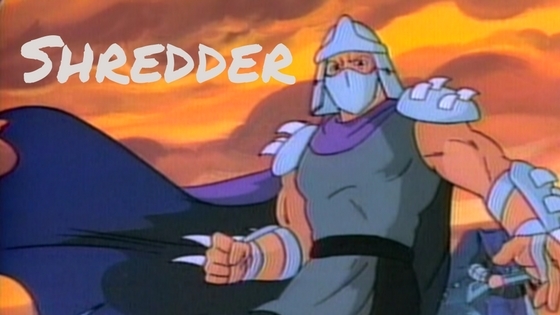 Shredder was a dope. But he was the main villain, so I'm stuck talking about him. Maybe I'll get to Krang later. Another one of the most recognizable voices in cartoons, Shredder was voiced by James Avery, who almost anyone knew as Uncle Phil on the Fresh Prince of Bel Air. I can't even think of another cartoon character, villain or not, voiced by him. After looking at his filmography, all I could recognize was War Machine in the Iron Man and Spider-man cartoons. I honestly wonder how TMNT picked him up for this role, but it was a great bit of casting.